We buy a lot of organic food. As much as we can living in the Midwest where you have to worry about the amount of pesticides in your water. But as time passes it is getting easier, cheaper, and there’s more selection for organic foods. The bananas pictured above are a great reason why we buy organic. The bunch I bought had about 7 bananas, and they were just starting the green-to-yellow process. Two weeks ago. Now, one of the food foibles of my family is to buy bananas, somehow only eat one or two, and all of a sudden within a week find ourselves with bananas fit only for bread-making (and during the summer, the trash). But when organic bananas made it on the local grocery scene (it’s not very exciting here so I am going to pretend we have a grocery “scene”), that all changed. 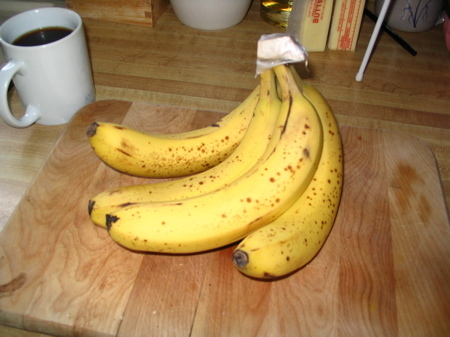 While these bananas have a few brown spots, they are still relatively firm and totally peel-and-eat ready. After two weeks. Regular bananas would be ready for the bread pan by now. We have noticed this with other fruits as well. While we refrigerate our apples, the organic ones last longer before getting mushy. And if we buy local organic food… it just goes forever. No two-week-long truck rides for our tomatoes in the summer. This isn’t necessarily a sales pitch to buy organic. For us, paying 40-cents more a pound isn’t a waste of money; it means our food doesn’t go to waste. How much food do you throw out every week because it goes bad? While part of the problem lies in menu planning (another post for another time), it also lies with the shelf-life of the food we buy. Organic is more expensive. But as I have been buying organically for about 12 years now, across the board prices are getting more in-line with “regular” food. Our grocery bill is still much higher thanks to not buying crap food, but we feel we get a higher level of quality for our money. Next time you are at the store, buy a bunch of regular bananas, and a bunch of organic ones. Make sure they are at about the same level of green-yellow. Set them side-by-side on your special bananas-only place and see who wins the stamina race. And the taste race, too.